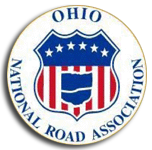 The Village of Norwich assisted ONRA in welcoming visitors by installing American flags along the historic National Road. 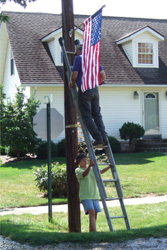 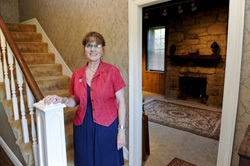 As shown here, Councilperson Jerry Allison placed his trust in the Old Stone House Nursery’s Kelly Lenhart as she steadied the ladder. 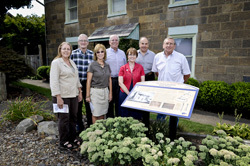 The sixteenth Ohio National Road Interpretive sign was unveiled on August 25, 2011. 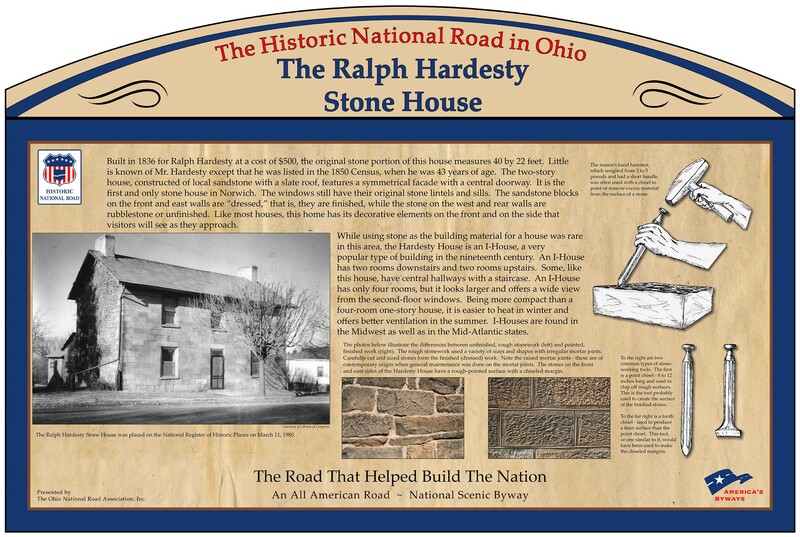 The sign, commemorating the Ralph Hardesty Stone House, is located in Muskingum County at 10405 Main Street (a bypassed segment of the original National Road) in Norwich, OH 43767. 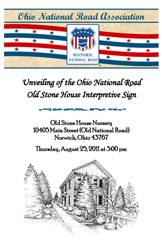 Shown is the Ohio National Road Interpretive sign awaiting unveiling. 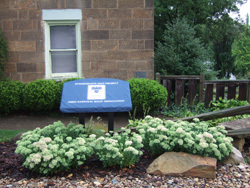 It is installed in front of the Old Stone House Nursery with ample parking available for easy access to the sign. 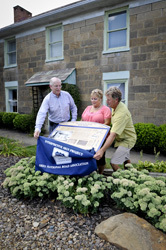 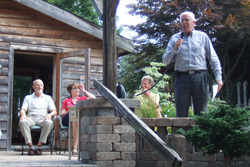 ONRA President Dean Ringle (standing) represented the Association at the unveiling and was joined by speakers (seated left to right): Norwich Village Council President Redge Wilde, former ONRA President and ceremony emcee Cyndie Gerken, and Old Stone House Nursery owner Tom Taylor. 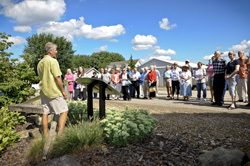 An outstanding reception with delicious hors d’oeuvres and beverages provided by the Old Stone House Nursery’s Tom Taylor and Kelly Lenhart was held following the ceremony. 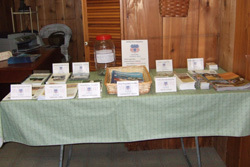 ONRA also had a display table (shown here) showcasing promotional and fund-raising items. 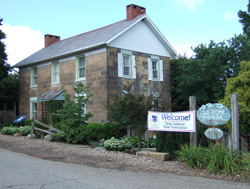 To find the Old Stone House Nursery and the Ohio National Road Interpretive sign, follow US 40 east from Zanesville and turn north on Norwich Drive. 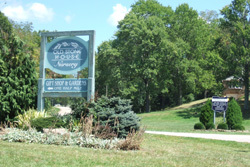 Continue east on Norwich Drive which becomes Main Street in Norwich, and the sign will be on the north side in front of the stone house. 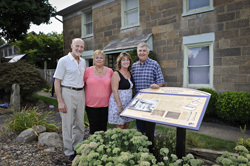 While in Norwich, visit the small memorial and historical marker also on the north side of Norwich Drive, at the eastern end of the village which commemorates the first fatal traffic accident in Ohio.